SNES Super Metroid (JPN/USA) "GT code, game end glitch" in 14:52.88 by amaurea, cpadolf & Total. Super Metroid is a very popular game with a long history of speedrunning and glitch exploration. One such glitch involving pressing Left and A together allows selecting glitchy beam combinations with a wide variety of side effects, most of which cause the game to crash. However, it was recently discovered that under the right conditions, one of the beam combinations (known as the "charged Space/Time Beam") can be used to reprogram the game! Thus, like Pokémon and Super Mario World, Super Metroid joins the collection of games that can be tricked into executing arbitrary code. In this movie, amaurea, cpadolf and total travel to the Lower Norfair region much sooner than you would normally be able to in order to use a hidden debug code to obtain beams and weapon ammo. After this, they use a glitch to trigger the ending credits around seven minutes faster than the previous fastest completion of Super Metroid. For more details, see the run's comments and discussion thread. 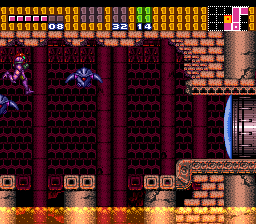 We have many movies of Super Metroid on this site. Among them are runs that complete the game using the X-Ray glitch, using no heavy glitches, aiming for the lowest legitimate ingame time, backwards, and while collecting 100% of the items.